Nursing Home Report | Assisted Living Report - These reports were published in conjunction with the Kansas Healthcare Association and National Research Corporation. The LeadingAge Center for Workforce Solutions is a brand-new center featuring workforce resources. This new center contains promising practices, ideas for key partnerships, tools to calculate turnover, presentation materials, fact sheets, LeadingAge member testimonials, podcasts, policy news, and other relevant articles. New! Download our LeadingAge Kansas-specific brochure to print and hand out to high-school and college students to promote aging services careers. If you are interested in co-branding this brochure with us, please contact Dana Weaver. Download this handy brochure from the Association for Gerontology in Higher Education to learn more about careers in the field. The brochure also provides great information on how to get connected at your local educational entity. This toolkit was developed for members to help them participate in the Careers in Aging Services Week, March 4-9, 2019. It has great information, brochures, social media ideas and more. View the toolkit. LeadingAge Kansas' Foundation hosts a scholarship program underwritten by generous donations from individuals and businesses to provide scholarships for member employees to advance their education in aging services. Since its inception, we have given out approximately $30,000 to deserving individuals across the state. The deadline for applications is August 1st of each year. Apply today! This webpage allows members to post their job openings at no charge for 30 days. Nonmembers can post for $75. This is the most visited page on our website after the home page. The single greatest impact on job retention would be to add more staff and supports to cover the needs of the residents. Average hourly wages for dieticians and nutritionists were higher in long-term care ($29.11) than in all other comparison industries ($24.86 to $28.33), except for the Home Health Care Services ($31.45). Average hourly wages for licensed practical and vocational nurses were higher in long-term care ($19.49) than in all other comparison industries ($17.49 to $19.40), except for the Total Government industry ($20.55). Average hourly wages for select occupational and physical therapy-related jobs in long-term care were higher than in some other comparison industries and lower than in others. Average hourly wages for registered nurses were lower in long-term care than in all other comparison industries. Registered nurses in Hospitals earn an average hourly wage of $28.19, which is $2.96 (or 11.7 percent) higher than the average hourly wage of $25.23 for registered nurses in long-term care. 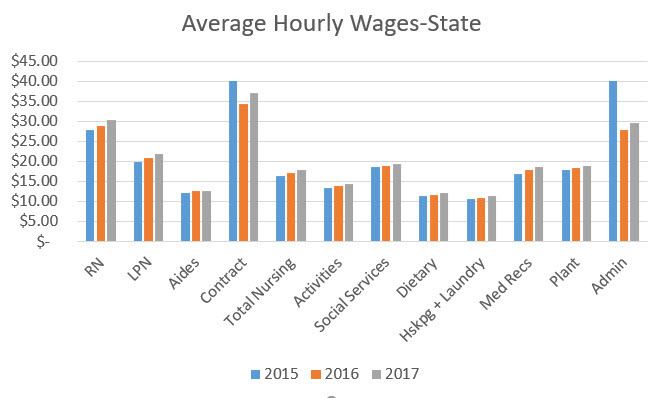 Average hourly wages for nursing assistants were lower in the long-term care ($11.29) than in all other comparison industries ($11.66 to $12.67), except the State Hospitals ($10.97) and the Psychiatric and Substance Abuse Hospitals ($10.73). This is the first report of its kind in our field in Kansas. Despite some limitations, it provides data for our long-term care members to use when considering wages. It also provides information for LeadingAge Kansas to use in testimony to legislators and through other advocacy efforts. We would like to thank Dr. Lawrence Panas and Kari Bruffett from KHI for conducting the research. Kari is on our Workforce Commission and has been an excellent voice for health policy. A tool developed by the association from cost report data collected by the Kansas Department of Aging and Disability Services. 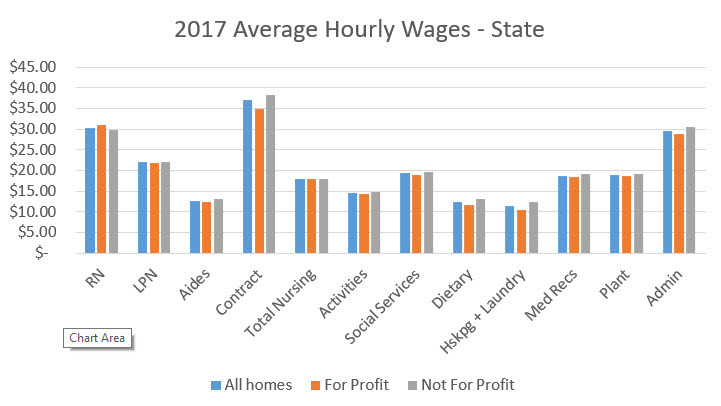 There is a section on staffing, turnover and wages to help members compare themselves with other nursing homes in Kansas. From wages to employment statistics, across states and nationwide, find the latest data on the direct care workforce. This website provides customized, up-to-date snapshots on this quickly-growing workforce. This resource-rich toolkit has all of the information and tools needed to build an solid and effective onboarding program for new employees. Incorporating a well-developed program reduces turnover of new employees significantly. Special thanks to LeadingAge Minnesota's Foundation for providing it to our members at no cost. Use this calculator to figure out the cost of your turnover -- download and do in Excel. The guide is designed to help members examine how personal care attendants work in their communities -- and to equip workers themselves with the skills they need to be successful. The guide has descriptions and check lists of the skills, knowledge and behaviors – competencies - to help personal care attendants deliver effective supports and services across a variety of positions and LTSS settings. The guide also includes a detailed table that breaks down specific tasks associated with performing the job. Which skills, knowledge and behaviors are covered in the guide? Basic technical skills: e.g., providing services and supports, e.g., infection control, activities of daily living and instrumental activities of daily living, etc. How an employee would apply the specific skills to different settings, e.g., understanding how to prevent abuse, understanding dementia, understanding the aging process, etc. Interpersonal skills, e.g., taking responsibility for one’s own actions, using different ways to communicate, understanding how to work on a team, etc. Highest level skills, e.g., understanding how to provide culturally competent care, assisting in developing a care plan, etc. For continuing education: look through the different skills and identify the skills that are critical to your organization and where more training for your staff is needed. For performance evaluations: incorporate the skills into your community’s performance evaluations. On-the-job-training and coaching: urge frontline supervisors to use the guide to build the skills of personal care attendants -- and coach their employees to improve performance in identified gaps. The guide is designed to help members examine how mid-level managers work in their communities -- and to equip workers themselves with the skills they need to be successful. The guide has descriptions and check lists of the skills, knowledge and behaviors – competencies - to help mid-level managers deliver effective supports and services across a variety of positions and LTSS settings. The guide also includes a detailed table that breaks down specific tasks associated with performing the job. Interpersonal: e.g., builds and maintains trust relationships with staff, residents and families, demonstrates effective communication skills, seeks opportunities for professional development, takes initiative and helps teams increase capabilities, etc. Operational: e.g., puts community mission and vision into action, models best practices, understands long-term services and supports, etc. Financial-Legal: gathers budget information, implements standards and regulations, etc. Human Resources: develops strategies to recruit and retain staff, ensures worker safety, etc. For continuing education: look through the different skills and see which skills are most critical to your community’s success – and where more development may be needed. Professional development: use the guide to develop professional development plans and select courses for skills development. Recruitment: Use the guide as a way to assess the qualifications of people applying for mid-manager jobs at your communities. PHI recently released A Recruitment and Retention Guide for Employers to help attract and retain a strong workforce in aging services. PHI works to transform eldercare and disability services. We foster dignity, respect, and independence for all who receive care, and all who provide it. As the nation’s leading authority on the direct care workforce, PHI promotes quality direct care jobs as the foundation for quality care. Many organizations wish to set up training and career paths for direct-care workers, but don’t know where to start. This tool helps employers take an objective look at their policies, practices, and processes to help them set up work-based learning and career paths for their front-line workers. Front-line workers generally have less than a bachelor’s degree, earn approximately $40,000 a year, and include assistants and technicians such as nurse aides, housekeepers, home health aides, medical assistants, and licensed practical nurses. Please contact Jennifer Craft Morgan at [email protected] for more information. LeadingAge Kansas has a history of focusing on workforce issues for members. The following programs were developed to help members save costs and access excellent services in the areas of Workers' Compensation and Health Insurance. LeadingAge Kansas' self-funded Workers' Compensation Pool. LeadingAge Kansas' association-sponsored health insurance Program.